Known limitation which will be fixed in future versions. 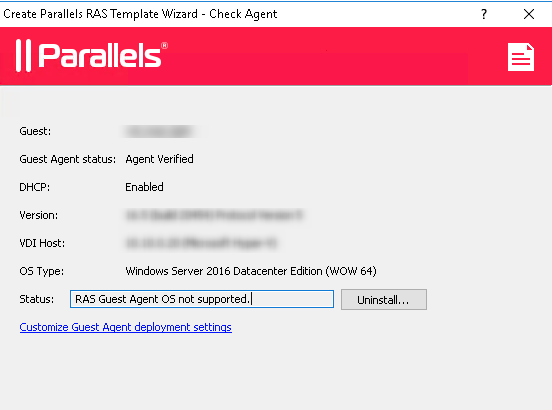 If a VM is running a Windows Server as the guest OS and you see the error that "RAS Guest OS Agent not supported", you can fix that using Parallels RAS PowerShell. If you haven't installed RAS PowerShell, run the Parallels RAS installer and install it. Exit the Parallels RAS Console. Open the Windows PowerShell console. Connect to your Parallels RAS farm (substitute the server name with your RAS Licensing Server name or IP address and type a password when prompter): New-RASSession -Server "server.company.dom"
Now you can proceed with configuring RAS Template.